Fifty-three days after exiting the race for governor amid allegations of sexual harassment, Democrat Nate Boulton has announced he intends to remain in the state senate. In late May, The Des Moines Register published the accounts of three women who said Boulton had groped or rubbed them inappropriately. Boulton dropped out of the gubernatorial race the next day. Late Monday afternoon, Boulton issued a written statement on Twitter. He admitted to binge drinking, suggested it was a contributing factor to those incidents and Boulton said he hasn’t had “a single drink” since November. 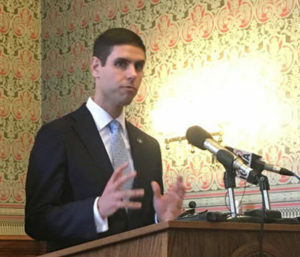 Boulton said he “cannot apologize enough for the heartache” his past actions caused, but Boulton concluded his written statement by saying he plans to return to the statehouse in January when the senate reconvenes. Republicans control the committee structure in the Iowa Senate, so GOP senators would have to launch an investigation. Boulton was first elected to the state senate in 2016. He has about two and a half years left in his four-year term.